OSCAR GIUNTA Supertrio! , comes to the USA as part of its new international tour that has already included several countries of Latin America, and continues to Europe and Asia in the course of the coming months and in 2020, then return to the USA for a longer tour and several cities, officially presenting the album just recorded in the mythical "Bacqué Recording Studios" in New York. (www.bacquerecording.com). The artist and his trio, come from Buenos Aires, Argentina, one of the largest cultural capitals in the world, which has an infinite melting pot of art and culture in all its variants, and of which Jazz is not exempt, a musical genre that has had there a simultaneous development to that it has had here in the United States, over the last 100 years. From this prolific and prosperous scene come artists such as Gato Barbieri, Lalo Schiffrin, Eddy del Barrio, Jorge Franzetti, Jorge Calandrelli, Jorge Dalto, Marta Argerich among many other Argentine artists who have excelled here in the United States and the world, and from whose tradition comes also Oscar Giunta and his trio, composed by two incredible artists such as the pianist Hernan Jacinto and the double bassist Flavio Romero, both also referential artists in their instruments and in music. It is known that Jazz is a Universal music, which in Argentina has crossed paths with Tango, Argentine folklore, Rock & Roll, Latin music, classical music, contemporary music and much more. 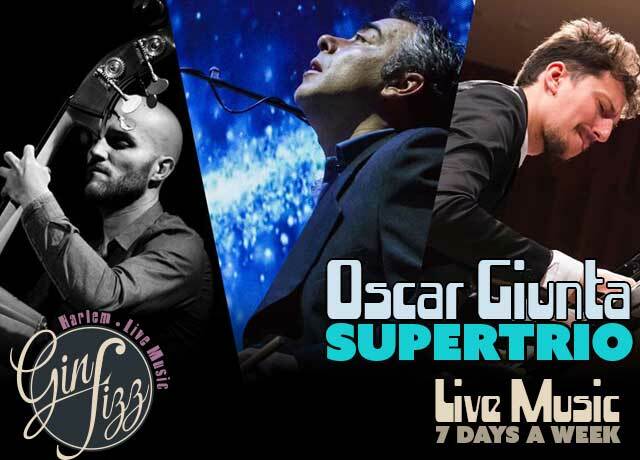 The OSCAR GIUNTA Supertrio! is an exquisite combination of all these musics and his spirits and soul , without ever ceasing to be an acoustic jazz trio, in which interaction, creative flight, lyricism, power, and the incandescent fire of collective improvisation, take the audience to unsuspected limits. The music that you will be able to hear in this concerts, is the fruit of his compositions, and a whole history of energy put on stage, over many years. OSCAR GIUNTA Supertrio! arrives at the U.S. Claire Jazz Festival 2019, with the endorsement and aplomb conferred by more than 7 years of presentations as a group, concerts and continuous tours, in which they have cultivated thousands and thousands of fans, where they have come with their music. Oscar Giunta is the leader of a great generation of drummers from his country, master of masters and an unavoidable reference and influence for jazz musicians in his country and beyond borders. Within the framework of this festival, you will also be able to enjoy the masterclasses that the artist will offer together with his trio.